Scan Copyright © Monica and Rob (Monimania) on Flickr. All rights reserved. According to Monica and Rob’s description, they were at an estate sale and found a box of unused Tupperware Wonderlier bowls. This paper insert was still inside. 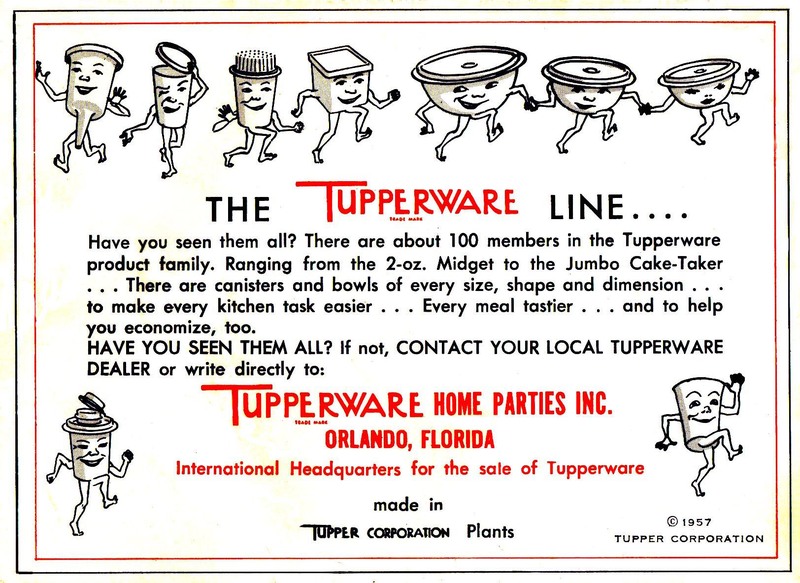 Anything with Tupperware always reminds me…if you have never seen the Tupperware! documentary from the American Experience series on PBS, it is an absolute must-see for any mid-20th century lover…plus a still-relevant tale for parents with young girls to show them their possibilities and particular dangers of the business world through the story of Brownie Wise (who I understand will soon be played in a movie by Sandra Bullock). Posted in 1950s, Food, Retro/VintageTagged advertising, Americana, container, containers, Florida, illustration, Orlando, plastic, storage, TupperBookmark the permalink.